It’s surprising how one’s tastes change over the years. 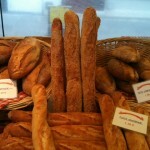 When I first arrived in France, just out of uni, I fell immediately in love with baguette – the lovely white squidgy sort. I even remember the price at the time (1975! ): 90 centimes. Francs, that is. Today it’s 90 cents. Euros, this time. You know, I just put that into an inflation calculator on the web and it comes out at +347%. Kind of frightening, isn’t it? Anyway, I soon learned there were different types of baguette, such as “moulé” and “non moulé“, depending on whether they cook it in a tin (moule) or not. I never liked the thing they call “un pain” which is a larger, shorter, often burnt and most unappetizing loaf that people seem to prefer when it’s stale. You can’t keep a baguette for more than a day, mind you, even for toasting. By next day, it’s rock hard or if you put it in a bread bin, it’s rubbery. Once you’ve decided whether you want it to be “moulé” or not, you can choose how long it’s been in the oven: “bien cuit“, “cuit” or “pas trop cuit” according to how squidgy you want it. A lot of the bakeries confuse “bien cuit” with “burnt” and “pas trop cuit” with undercooked. 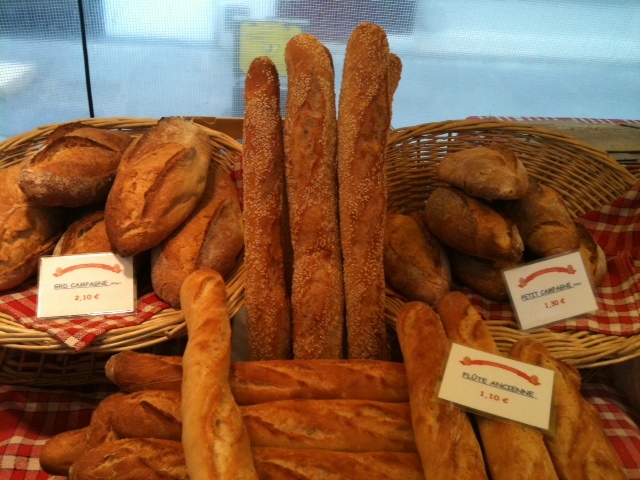 You can actually have a baguette that is well cooked inside and normal colour on the outside. However, being an Anglosaxon, they won’t let me argue with them and I have often left the bakery at boiling point because they refused to give me what I wanted. My better half, Relationnel, prefers his “bien cuit” while I only like the “pas trop cuit” variety. I did give vent to my anger once and couldn’t show my face in the bakery again, I was so embarrassed. There were a lot of people there too that day because we had been waiting for the next batch of bread to finish baking. It was a big pity because they used to sell my favourite baguette and after that, I always had to get Relationnel to buy it instead. I learnt to say “bien blanche” in other bakeries which seemed to help. When my kids were small and I was going through my “bio” period, I started buying a multi-grain loaf from the health food shop and we kept baguette for a Sunday treat. Most of the time the “bio” loaf was the right colour but sometimes the baker would forget to take it out of the oven in time and it took on a darker burnt siena hue. I was always amazed that they would sell it anyway. The organic bakery eventually closed (maybe it got burnt down in the end!) and I had to find a substitute. Around that time, bakeries in general began making all sorts of different breads and you could get a decent loaf of multi-grain in most bakeries in Paris. But when we went away on holidays, we’d have to go for miles to find bread we liked. Alongside the squidgy baguette, you would now see the “baguette tradition“, made with unbleached flour and a lot more expensive than the normal baguette whose price is regulated. No doubt a subtle way of increasing prices … But we eventually moved over to the tradition which is really much tastier and never squidgy. But I’m not into squidgy any more. After we moved from the suburbs into the centre of Paris, I had to look for another bakery. We tried “Chez Julien” and “Gosselin” on rue Saint Honoré, reputed to have supplied the presidential palace at one time. Julien doesn’t open on Sundays, which is a bit of a pain, because that’s our oyster day and you have to have good bread with oysters. Gosselin has inconsistent quality, in my opinion, and is always full of people. There was one vendor that would systematically give me the opposite of what I asked for. When I lived in the suburbs no one took me for a tourist but now that I live in the 1st arrondissement, I often get spoken to in pidgin English and given bad service. Even though my French is probably better than theirs most of the time! I started to eat less and less bread, which probably wasn’t a bad thing, just keeping it for the oysters on Sunday. Then we spent Christmas in a gîte in Normandy and the lovely owners, who live nearby, offered to lend me their bread-making machine. Relationnel had refused all endeavours on my part to possess one on the pretext that it would take up too much room. But Valérie kindly gave us flour and yeast as well and I made batch after batch. Everybody loved it, so when we got home I started checking out the consumer magazines to buy my own machine. Valérie had said hers was a cheap one and had a few drawbacks so I finally settled on a more sophisticated Kenwood mainly because you could make smaller loaves. I was a bit worried about the long-term effects of all this delicious bread. The first batch was a diasaster. Completely flat. This went on for a while, gradual improvements alternating with total flops. One of the main reasons is that Kenwood is American and all the recipes are based on American flour which it turns out is not the same as the flour you buy in France. Then one day, when we were coming home from holidays in the south, we stayed overnight in a chambre d’hôte in Georges Sand country. The hostess told us about a wonderful pumpkin fair next day in a place called Panzoult. I’ve never seen anything like it. The winning pumpkin, grown on a pallet so it could be taken to the fair, weighed 600 kilos. There were all sorts of pumpkins and squashes – even a butternut or two – and a local miller selling flour. 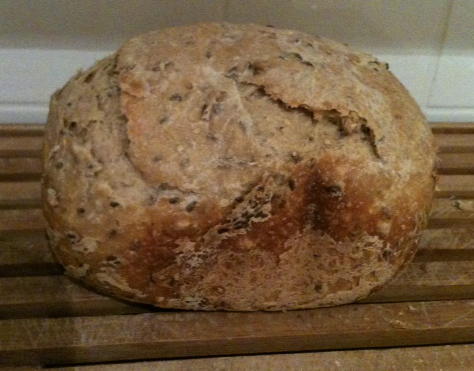 I told him about my bread-baking problems and he sold me some multi-grain flour and dried yeast. Imagine my surprise when I saw the kangaroo on the packet! He said it was the best yeast in the world and that they imported it from Australia! Ah ha! Immediate success. Every loaf was perfect.Then the flour ran out. I rang the bakery but it isn’t open on weekends and it’s a bit far to go during the week. I know a 3-hour drive isn’t much for Australians but you have to remember that the traffic in and out of Paris can turn an ostensibly short trip into a nightmare. So I kept trying out other types of flour and cut down drastically on my bread intake. Another trip away – you may have guessed by now that we go away a lot – took us to a chambre d’hôte in Briare near the famous canal bridge built by Eiffel, but that’s another story. At breakfast, I congratulated the hostess on the lovely bread. Home-made. And would you believe where she goes to buy her flour? No, not Panzoult. But to the supermarket next to our gîte in Normandy when she goes to visit her family. She says she makes perfect bread every time. I looked up the supermarket chain on the web and discovered that all their stores are in the west of France, the closest being an hour and a half away so I emailed them to see whether the flour mill might be closer. No such luck so we went to the closest one on the list. It was in a very dicey, most unlikely looking housing estate, but they had the flour. I bought up as much as I could considering the sell-by date. Ever since, I have been making perfect bread twice a week. Relationnel still prefers “baguette tradition” with his oysters on Sunday but he buys it himself at the market and I no longer have to put up with people not giving me what I want! 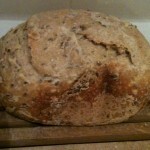 I love the bread story – I love bread; and that probably shows! It’s a worthwhile experience to “diarise” (become a diarist perhaps) or blog. I know it helped me when my father became ill and then of course I traveled to Europe where I made an effort to write entries “on the run” so that he could read them. Maintenance got a bit patchy after that and the whole thing has been a bit neglected of late. I have (rather tragically) left the web site posted but have considered tearing it all down but it has become a bit of a memorial for me (and no one visits anyway!) Your wonderful effort might inspire me to resume.